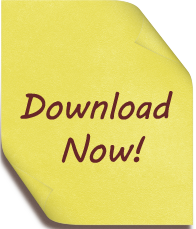 You are here: Home ∼ 2014 ∼ April ∼ Dental care in Kids: When? How? and Why? Dental care in Kids: When? How? and Why? Just like every other aspect of healthcare including dental care in adults, dental care in kids is also purely triggered when a cavity has already occurred or some problem has occurred and all possibility of preventive care has been lost. Dental care in kids, ideally, begins at the birth of the child. Yes, even before first tooth has surfaced and provided immense joy to parents. Dental care that begins at birth ensures a healthy beginning with respect to taking appropriate measures in oral care. 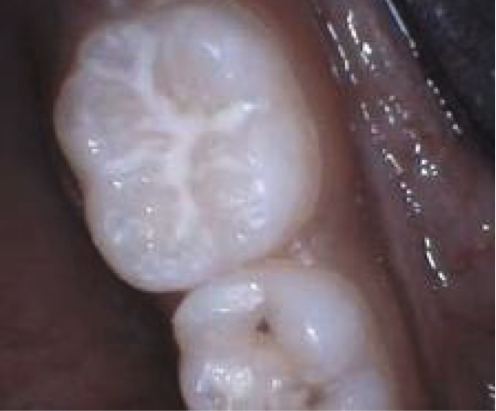 – Primary teeth (so called milk teeth) form a strong basis for future permanent dentition. Milk teeth on average start to erupt by 6 months to 1 year and continue till 2-2½ year. – The first milk teeth to fall are the front ones from the lower jaw at approximately 6 years of age, and the last tooth to fall are the milk molars at around 12- 13 years of age, during which there is a lot of transition of them falling at various intervals with permanent teeth taking their place. – It is thus of extreme importance that these milk teeth are taken care of as they are not only required for chewing but also guide the permanent teeth in their place, growth of the jaws, normal speech and aesthetics. – Severe tooth decay may lead to pain and infection which may harm the permanent tooth bud. Early loss of these teeth may cause malalignment of the permanent teeth. – Hence managing of such decayed teeth becomes imperative, which may include taking x-rays (even of toddlers), simple restorations(fillings), root canal treatment, putting caps, extractions, space maintainersetc depending on the degree of tooth decay and history of pain and swelling, if any. Taking your child to the dentist early often leads to a lifetime of good oral care habits and it familiarizes your child to the dental office, thereby reducing anxiety and fear, which means stress free visits in future. The first dental visit should be by the child’s first birthday or when the first tooth erupts. Following a 6 monthly recall at the Pediatric Dentist will help in being counseled on oral hygiene measures and feeding habits. Parents should make it a part of so called ‘Well baby care’. 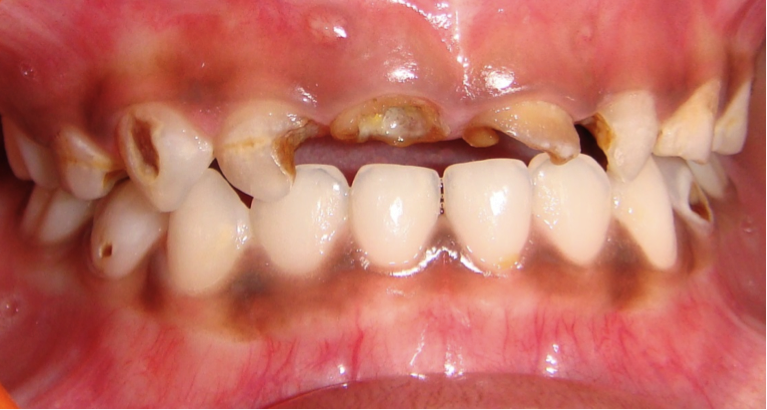 Inappropriate feeding habits often leads to a condition known as “Early childhood caries” or “Nursing Bottle Caries”. Whenever the child is put to bed with abottle containing milk, juices, sweetened formulas or given unrestricted breast feeding, especially after the first tooth erupts in the mouth causes severe destruction of the tooth structure which leads to rapid dental decay. It is extremely important to take good care even before the first tooth erupts. – Wipe the gum pads with a clean, soft damp cloth after every feed. – Introduce a cup to the child and discourage the use of bottle by their first birthday. – Introduce a baby brush with a non- fluoride tooth paste by one year. – By two years, you can start using toothpaste with 500 ppm of fluoride and once the child learns to spit and gargle, and also when the child accepts the taste, switch to a 1000 ppm fluoride. All toothpastes will have the fluoride content written. – This can be used for children residing in areas with no fluoride/ optimum fluoride in their drinking watersEg: Mumbai, Pune, Agra. Many cities in India have fluoride levels in their drinking waters, which varies in ground waters/ bottled water. The permissible upper limit for fluoride in drinking water is 1.0 ppm in India. Parents/ caretakers should typically provide oral hygiene care until the child is old enough to take personal responsibility for the daily dental health routine of brushing and flossing (the recommended age for flossing is 6 years by which the children develop the necessary dexterity). – use of topical fluoride agents in adjunct to toothpastes are fluoride mouthwashes, gels and varnishes specially in children who have been extremely prone to decay as an adjunct to brushing. – Topical application of fluoride gels and varnishes at the dentist every 6 months is recommended for children. Fluoride strengthens the enamel of tooth and makes the surface of the tooth hard. Sealants– the chewing surfaces of the molars have deep grooves and fissures. There is a high tendency of food getting caught which leads to formation of cavities. Sealants are shaded or clear plastic applied to the teeth to help keep them cavity free. Sealants fill in the grooved and pitted surfaces of the teeth, which are hard to clean, and shut out food particles that get caught, causing cavities. Application of sealants makes the surface of teeth self- cleansing. Dental decay depends on many factors one of them being DIET. Sugar containing foods are not just chocolates, but a variety of foods that promote tooth decay. Reduce the intake and frequency of refined carbohydrates. Avoid sticky foods and replace refined with unrefined natural foods. Biscuits, chips, breads which have starch should be avoided. If you replacebiscuits, chips for the snack boxwith cheese, nuts, fruitsit will help. Increase the intake of fibrous foodeg: carrots, oranges, green leafy vegetablesto stimulate salivary flow as saliva is naturally protective against caries. Give caries protective foods such as cheese, nuts, raw salads, fruits. Stimulate salivary flow with Xylitol containing chewing gum between meals for older children. 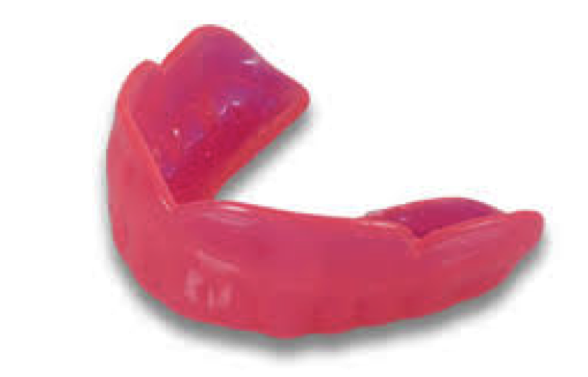 Mouth Guards- Mouth guards are a must for any child who is into contact sportse.g.football, martial arts, basket ball. They are made of soft plastic and fit comfortably to the upper teeth. Mouth guards are often customized and they are useful in protecting the child’s teeth, lips, cheeks and gums from sports related injuries. Traumatic Injuries-In unfortunate accidents wherein the child knocks his/ her permanent tooth, it is extremely crucial to act immediately by replacing the tooth back in the socket and hold it with clean gauze. If you can’t put the tooth back into the socket, place the tooth in milk or saline and contact your pediatric dentist in either of the situation. Dr Mitali Kochar, M.D.S (Pediatric and Preventive Dentistry) has received her Master’s degree from the Bharati Vidyapeeth University- Pune in 2011 after obtaining her BDS in 2007. She has various publications on clinical pediatric dentistry and has participated at various conferences. For past two years she is working at an exclusive pediatric dental clinic, dedicated to rationally managing dental needs of children. Her main focus is preventive dentistry. Mitali has just been blessed with a baby girl and we are sure she is going to practice what she is advising others about. Superb description of problems and their prevention. You are absolutely right. Preventive dental care is unheard of. @ Rohini- to help for any query Thank you. Will be glad for any query. @ Rohini- Thank you. Will be glad to help you for any query. A must read for all mothers; thanks Dr. Mitali. Too good! Knowledge that we quite required..
Amazingly light thrown on preventive measures to be taken..
Alignment of all the teeth along forms perfect jaw structure and a good jaw structure gives a good face cut. I personally had to get my permanent teeth removed and undergo allot of dental surgeries due to lack of awareness and my personal fear . Such a nice step to spread the world ! great job doctor!! the article sure helps to instigate dental care actions for the juniors… thumbs up!! True … I try following ur suggestions with my kids . Younger one is really stubborn n does’nt brush properly .. Any suggestions or tips for her ?? wowie…fantastic blog dr mitali…will defi follow all ur suggestions here n many more ….would love to consult u in case of ne problems for my kiiddo……thnx for all the information…..
@ Priyanka- Thank u very much. @ Neha- It is indeed a task for the mothers to follow a routine for their kids oral health care. Brushing morning and night is not negotiable. Let them keep a separate brush if they demand to do it on their own. (Consider it as not done). You carry the brushing either before or after they wish to do it. For more tips on brushing – we will post the article soon. Truely v informative n vl defnetly help to tkcre nd prevent dental problems in juniors nw wth proper knowledge nd awareness spread by ur article…thnks mitali. Good job Dr. Mitali! Very informative!! Too good ! Excellant job done. Loved the article.i am surely going to pass this to all my friends. The information you have provided is eye-opening. Dental care is generally ignored until you end up with some problem. I think the present generation mothers should be aware of this info to help their children. That’s a great information.. Earlier we were not aware of the measures to be taken to take care of our children’s oral health.. Thank you Dr. Mitali.. Very well written article.Am sure this article will help all the mothers to take care of kids dental issues. All the best. Very informative,every parents should know this . @ Aanchal- Thank u very much..
@ Priyanka- Thank u so much. Thank U Vinny! Hope it helps. Thank U Namita. It would be useful for all the mothers/ caregivers to children. We are sure you will do very best in your life and will be an asset to Society. @ Anu- it is very heartening to know that u will share it with your friends. Dental care foundation should begin early in life and give importance to milk teeth too!! @ Jalaja Aunty- Thank u for ur appreciation. Unfortunately it is true that first dental visits by 1 yr of age, preventive treatments, regular 6 monthly follow ups protocol has still not found its place in Indian scenario. This awareness for mothers/ caregivers should bring about a change. @ Alka Aunty- Thank u very much. @ Reena Bhatia- Thank u. The awareness of oral health care for infants and kids is extremely important and will bring about the change in prevalence of dental caries. What worked for my grand daughter, is have one toothbrush for her in every bathroom of the house and 4-5 in her own bathroom. This way whenever she agrees to brush, bingo there is a brush. & she loves to choose and pick one of her fancy, that day, when in her own room. @ Sameer- Thank u for your appreciation. I really hope it helps. @ Pulina- Thanks so much. @ Sanjeev Sonali/ Sunita- Thank U Very Much!! @ Dr Asrani- Its an indeed a great way of motivation in kids. An a fun way too. It’s a very informative article throwing light on rather common mistakes that mothers do… will now be more careful and vigilant with the kids oral hygiene and health. Thank you so much. Very informative and very nicely expained! Awesome blog Dr Mitali!! Excellent description of issues faced by kids and ways to prevent them. A very informative article looking forward for more. Good luck. Excellent description of issues faced by kids and ways to prevent them. A very informative article looking forward for more. Preventive dental care is a mainspring of optimal oral health. Dr. Mitali you sure provide interesting & functional knowledge in which children really can sink their teeth into – your article. You impress upon the reader so simply yet effectively on the content aims to explore children structure, development and importance. very informative article mitali…..thanks for sharing your knowledge with us…. thr are so many small small things which we tend to ignore but after highlighting the facts in ur blog..the oral health will b better taken care. Dr Mitali.. Certainly a very informative article for all the parents.. It is very important to take care of a child’s teeth from the beginning to avoid extensive treatment in future.. I wish every parent reads your blog Dr. mitali.. It is a very informative article and we need to spread the awareness regarding preventive measures that one can take to prevent dental problems in their children..
Leave a Reply to Dr Chander Asrani Click here to cancel reply.